FORT WORTH, TEXAS (November 6, 2018) – Vetoquinol USA, a world-class developer of veterinarian-approved formulas for large animal healthcare products, announced the recent launch of its rebranded EQUISTRO® product line. The rebranding includes new packaging for products, and all EQUISTRO products are now available to purchase over the counter in veterinary clinics and in retail stores that sell feed, farm supplies, horse tack and equine products. SECRETA PRO MAX and CHRYSANPHYTON, which were previously sold under Tomlyn, are now part of the rebranded line as well. CHRYSANPHYTON: a daily supplement used to help promote and support normal circulation and vascular function in horses. It can be used for horses that can benefit from extra lower leg and hoof support. 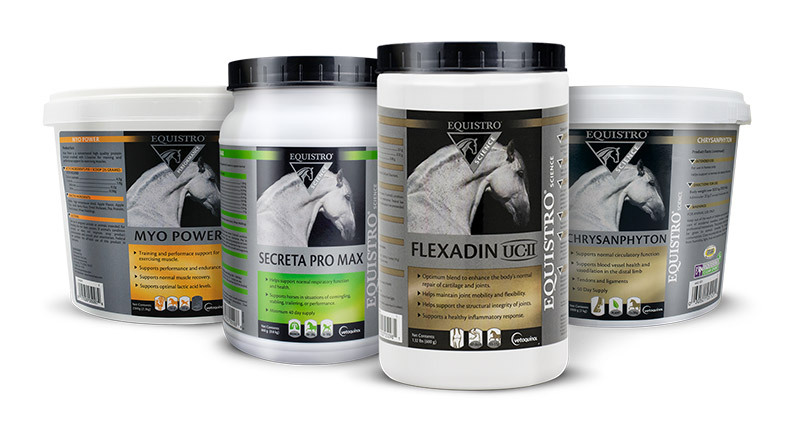 FLEXADIN UC-II®: a unique product with the patented UC-II ingredient designed to help keep horses healthy and physically active as they grow older. Daily administration helps maintain joint mobility and flexibility. MYO POWER: a product designed to support performance, endurance, and normal muscle recovery. It contains readily assimilated proteins originating from milk, in addition to the branched-chain amino acid, L-Leucine. SECRETA PRO MAX: a health supplement formulated for horses to support normal respiratory functions. It contains over eight beneficial herbs and vitamin E. All of the combined ingredients help to support the bronchial system when challenged.